My fundamental analysis was spot on, as the euro has been weaker over the past couple of days despite the “progress” made with the Cyprus bailout deal. Apparently, the markets are still edgy over the whole situation and that’s why we haven’t seen the euro bulls make a comeback. Instead, investors have turned their attention to the pound, which is currently acting as somewhat of a “safe haven” amongst the European currencies right now. This has allowed EUR/GBP to break for new lows. 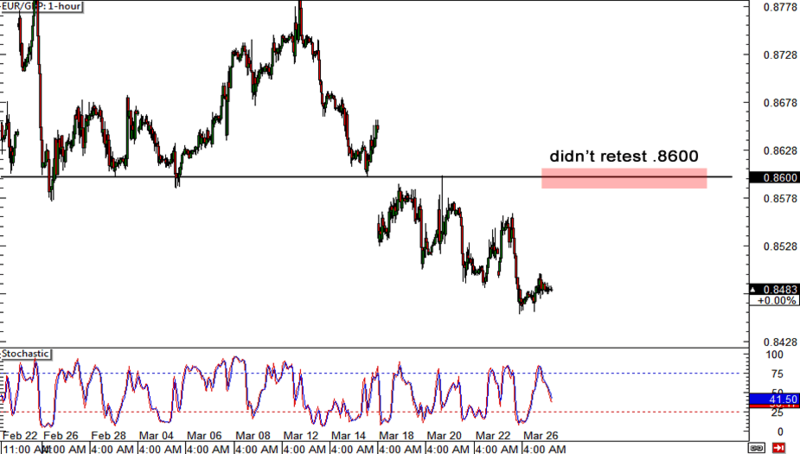 Unfortunately, you don’t get pips in the forex market for trying – price action has to get you triggered as well! We didn’t quite see the retracement that I was hoping for and I missed the move lower. So I’ve missed the boat on this one, but I’m still in high spirits. I’m confident I’ll be able to catch the next wave in the near future! Congrats to those of you who were able to bag some pips playing EUR/GBP last week! Let me break this trade idea down for y’all! The euro zone has been battling its debt demons again on renewed contagion concerns in the euro zone over Cyprus’ bailout, and the markets have been taking their concerns out on the euro. On the other hand, the pound has been showing surprising resilience as of late. Some even say that its strength stems from the euro zone’s weakness, as the U.K. has been acting as a safe haven in Europe. Technically speaking, this setup looks as solid as a rock. There’s a major confluence zone around .8600. It was a solid support level in the past and it lines up really well with the previous week low. 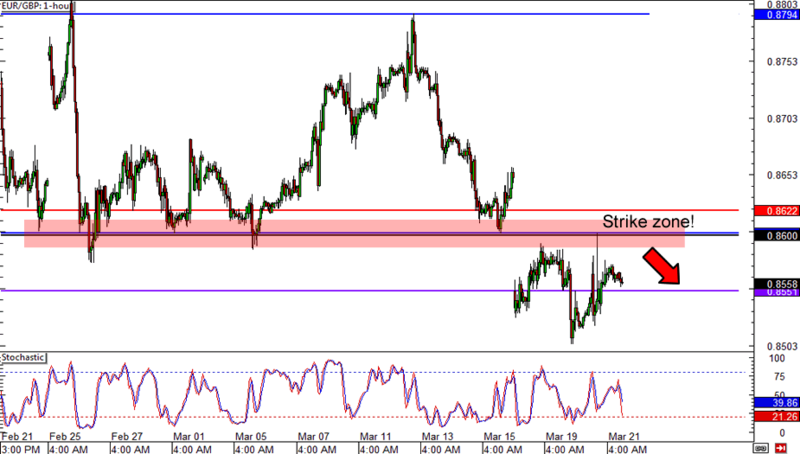 Sell EUR/GBP at .8590, stop loss at .8635, profit target at .8500. I set my stop clearly above the top weekly ATR and my profit target just around the previous low. If all goes according to plan, I should walk away with a 2:1 return on risk, which translates to 1% given my 0.5% risk. What do you guys think of this trade? Anyone out there willing to join me?